My 2018 economic predictions follow through on the accurate predictions I made in 2017. In my last article, I stated that I had bet my blog the stock market would crash by January 2018. That was my thinking back then based on where Obama had been taking us. In fact, however, when I went back last week and rechecked my economic predictions and my bet, I found I had wisely revised my thinking even that far back and had hedged my bet due to the Trump factor. I realized even at the very start of Trump’s term that, for the short term (2017-2018), Trump would seriously alter the timing of our trajectory toward economic collapse that had been laid in during the Obama years — the path by which I had been predicting an economic apocalypse would soon be upon us. I had also predicted in 2017, though, that Trump would not improve things over the full length of his term because our underlying economic woes would only get worse … even under Trump. I made my promise when a naysayer challenged my 2017 economic predictions, which turned out pretty accurate, as I see now that I’ve gone back and reviewed them. What if no Apocalypse happens in 2017 and even 2018? Promise to us that you will publicly apologise and admit that you scribbled tons of outrageous BS. The Trump plan is, indeed, massive; and, if congress passes it, there is bound to be a lot of short-term lift. If congress doesn’t pass much of a plan, on the other hand, the stock market has banked on it already, so it will fall quickly. Trump’s plan in my opinion is largely short-term medicine that is long-term poison. Stocks could really shoot up if all this corporate money gets repatriated to support buybacks or payoff of debt used for earlier buybacks and if corporations wind up getting a retroactive tax break. Exactly when [economic collapse will happen] I’m not as certain because the election [cycle] changed things…. So for the very short term Trump’s policies may boost the economy, but mid-term and longer, Trump and his cabinetful of bankster-barons are not going to be able to stop these numerous trends from crushing us. Trump has expressed no plans to solve any of these overwhelming structural flaws that are trending against us…. So, the situation toward the latter part of this year looks worse socially [a reference to the political rage I had said was going to continue throughout 2017] and, in years to come, looks much worse financially and socially. The stock market will rise … for awhile, at least. What we know from trickle-down economics is that it certainly does stimulate the stock market. The money that is saved on capital gains and corporate income and that is repatriated in corporate income from overseas largely goes into speculative gambling in stocks. It is unlikely that Trump’s infrastructure stimulus plan will make it off the ground in 2017. Spending will certainly increase in one area — the military. Regulatory changes will also lubricate the economy to move forward with less friction. will do anything they can to restrain Trump’s plans to drain the swamp in Washington and as well as his plans to align with Russia and his plans to diminish nation-building efforts. By which I meant they would likely be successful. Trump’s tax plan — a third (and”trumped up”) round of trickle-down economics — would certainly pass in 2017. His enormous tax changes made it harder to for me predict the movement of money in 2017 because his tax plan is vastly different than all preceding years, leaving no pattern to go by. It was clear, however, that Trump’s changes would succeed in moving massive amounts of money back into the US. . Under his plan income gaps between the rich and all the rest would increase in the years to come (yet to be seen), leading to more class warfare years down the road. Trump would enthusiastically continue the immoral game of spending the next generation’s money to fund our own generation’s hope for recovery and to make our lives easier; but his plan would not resolve any underlying problems our economy has and eventually will worsen those problems, such as our massive national debt (which already places a half-a-trillion-dollar debt-service strain on the economy each year even at record low interest). This will leave future generations with worse problems than we have already established for them and nothing to show for the debt we hand of to them but a collapsed nation. Trump’s infrastructure stimulus plans would not happen in 2017, but military spending definitely would increase. US nation-building would continue throughout 2017, in spite of Trump’s promises to move away from all of our military experiments. Globalists (a.k.a., “the establishment”) would succeed in restraining Trump’s plan to realign with Russia, which he had said he would like to do during his campaign. Hillary would not be going to jail in 2017 — not even close — in spite of all of Trump’s campaign cajoling that all but promised his base he would make sure she does. Bailed out banksters would not be going to jail either under Trump any more than they did under Obama, so they would continue to be moral hazards as much under Trump as ever — if not more so because he was giving them all of his financial cabinet positions. Too-big-to-fail banks would just keep getting bigger (an underlying problem that would only get worse), and Trump’s deregulation of them (by undermining Dodd-Frank) would only exacerbate their destructive potential over time, but Trump’s deregulation would accelerate the economy as certainly as deregulation did before 2008. Trump would not in any way change the globalist makeup of the world’s banks nor their path. (He would not even attempt to.) Therefore, the Fed’s manipulation of the stock market (and really any market it wants to manipulate) would remain unchecked under Trump (in spite of his campaign threats against Yellen and the Fed, which would all fade into empty rhetoric, intended only to stimulate his base). The housing bubble would continue to get more bubblicious, but a decline would become obvious in certain areas in the summer. A collapse greater than we saw in 2007-2009 “might” start as early as 2017 in various parts of the world, including the US, but particularly in Canada and Australia and the UK as well as New Zealand and Sweden. The above trends, along with aging demographics and rising interest on the national debt, would continue to worsen and will remain the forces that determine our long-term trajectory, which is toward economic collapse (as Trump would do nothing to improve any of those problems and will make most of those problems worse, assuring long-term decline). However, for a short time, we would see a burst of economic improvement. (2017 and the first half of 2018 being that short time, after which I expect to see a reversion to the overall trend of decline caused by the forces delineated above, made worse by Trump’s plans). Economic collapse would probably become evident by the end of of 2017 (which it did not, but that is where I hedged my bet in terms of what I actually promised by giving myself until mid 2018 if I was going to make a public apology for being wrong). If 2016 Wasn’t the Epocalypse, What the Heck Was it? I’m laying all of that out because I think you’ll see that the overall list pretty accurately stated where things would head (what things would turn out to be prevailing forces), even some of it was off a bit in timing or severity. That’s why my 2018 economic predictions don’t really look any different than those for 2017. As shown above, I had already hedged my bet for the timing of economic collapse because 1) Trump altered the course, and 2) experience has taught me that these things take longer to play out that I am inclined in my gut to think they will. The timing recollected should have said “after the first half of next year ” not “within the first quarter,” and I should have stated that I had said I would apologize mid year and probably even stop writing the blog by the end of the year (meaning if I was clearly way off). So, we are not there yet. My memory when I wrote my last article was holding me to a higher standard than what I had actually promised. I realized, even as I wrote out my 2017 predictions, that Trump’s first year was going to improve the trajectory we were on (a change that I had no pattern to go by unlike the Obama years). I continue to believe, however, the Trump effect will only improve the economy for the short term because it actually exacerbates the major underlying economic problems over time. The reality of the tax plan for the short term should prove better than the hope of the tax plan that the market expanded on last year. The new tax savings will provide a flood of money that will probably comparable in size to the Fed’s QE3. Now, instead of stock market stimulus coming from the Fed, it is coming from government coffers in the form of massive corporate tax breaks to be funded by more government debt. And just in time to replace what the Fed will be removing (at least, for awhile)! 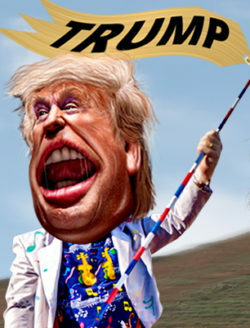 The tax breaks will feed the stock market because most of the money recouped from the tax breaks will go into stock buy-backs, dividends and mergers and acquisitions (which will reduce jobs to the extent that the happen) … and executive bonuses and pay raises. Why would the money go anywhere other than where all the cheap corporate bond money was going when interest rates were down and where all the QE went? It’s the same people making the decisions. Some of it, of course, is likely to go toward paying off that corporate bond debt now that bond interest is likely to rise. To the extent that some of those tax savings are going into the general economy in the form of small labor bonuses (a thousand dollars or less), it will aid the economy, which will also be good for stocks; but bonuses are one-time show-and-tell. They are not wage increases. Very few companies have announced wage increases. The Trump tax cuts, as much as I hate the plan for long-term reasons, almost have to stimulate the economy and are already stimulating the stock market. The idea, however, that those savings for the top 1% and the corporate savings will trickle down to the average person in any lasting way is ludicrous, given two previous major rounds of trickle-down economics that clearly didn’t trickle. Money is more like pitch than molasses, sticking in the cracks, rather than flowing down through them. The part of the tax break that doesn’t go to stock buybacks and dividends will go to executive bonuses or salaries, which will, in themselves, probably be used mostly for more stock purchases. I believe the stock market will start to lose lift and show signs of stalling when the Fed’s graduated unwind of quantitative easing reaches the level where the downdraft from the Fed’s quantitative squeezing becomes greater than the uplift from Trump’s tax breaks. The Fed says it will reduce money supply by $20 billion per month this quarter and that this squeezing of the economy will increase each quarter by another $10 billion per month until it hits $50 billion a month in the final quarter and continues at that level for another couple of years. That’s 60% as much negative force as the $80 billion per month of stimulus they pumped into the economy under QE3. It cannot be without effect any more than QE3 was without effect. On the other side of this timing equation for the downdraft effect on the market, I don’t think anyone knows for sure how many billions per month Trump’s tax savings will actually add to the economy — not talking GDP growth, just money saved and available to spend compared to the amount of money being sucked out by the Fed. So it is almost a guess as to whether by mid-year the Fed’s squeeze will be substantial enough to be felt as gravity against the massive tax lift, making the stock market’s climb more difficult and erratic; but that is what my original bet was based on. I still think that has some chance of proving out as I thought it would. Of course, some black-swan event like a war with North Korea or failure to raise the US debt ceiling could cause the market to drop before it dies of natural causes. At this point, I think the bond market is likely to crash before the stock market. While I’ve expressed in previous comments about a year back that I was not sure which would break first, the new tax plan now makes a bond-fund crash my pick because the new plan lifts the stock market at the same time that it drives up interest on bonds. While I think some downdraft from the Fed’s unwind is likely to be felt by late spring (showing up in summer reports), the impact probably won’t be apparent to most people until fall, which is when the Fed’s unwind becomes quite sizable each month (if they stay on their promised schedule, which so far they do not appear to have been doing). How do you 1) lower taxes extremely, requiring more government debt, 2) increase government spending on fiscal projects, requiring more debt 3) increase government spending on disaster relief, requiring more debt, 4) increase military spending, requiring more debt, and 5) rapidly reduce the nation’s money supply, which 6) removes the Fed as the government debt buyer of last resort and 7) raises interest rates all at the same time … and not crash the economy? It’s hard for me to believe the Fed and its political consorts actually think they can do all of that. I see a train wreck coming. 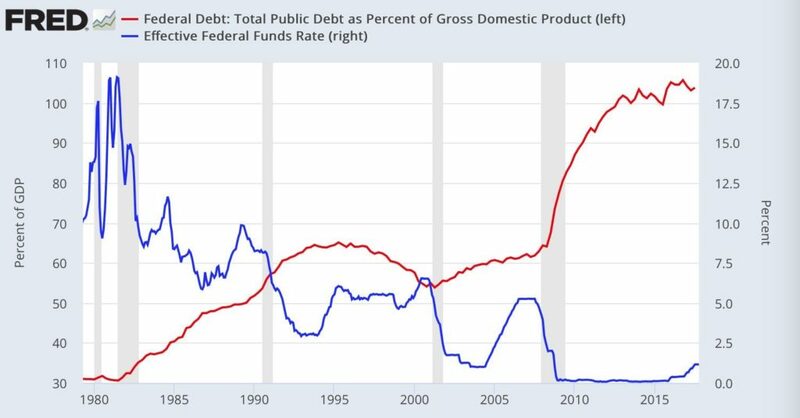 Since stock support is coming from greater government debt and all infrastructure spending will come from greater government debt just as the Fed is backing away being the government’s funder of cheapest resort, bond yields should rise quickly (compared to how slowly they fell). That means bond prices fall quickly as those who want to sell old bonds with lower yields will have to drop the price they ask for the bonds they are holding in order to make their bonds salable. That means bond funds will have to sell bonds at a loss in order to cash out any people who want to move from bond funds into rising stocks … or who simply want to move out of imperiled bond funds to put their money under a mattress. Things can snowball quickly. As a sign of things to come, ten-year bond yields at the start of the year broke the highest point they had seen since last March, and the treasury curve (the spread between short-term bond interest and long-term bond interest) steepened the most it has since Trump was elected. It wasn’t huge, but it was a tremor. I think it was a foreshock. When you consider that government debt has never been anywhere near this high, and that leaning tower of debt is supported by rates that have hardly been lower, what happens when things normalize a little? It’s an election year, which means opportunity to undue what happened in 2016. That will create its own unrest. Because the Trump tax cuts are the greatest gift the one-percenters ever saw, I anticipate the gap between the rich and the rest will grow increasingly stark, creating further social unrest. That spread, however, will take time to develop; but many people who see it coming will revolt now. Those wanting to change the results of the last election will have something to work with. The full unrest will take a few more years to build, but that is where all of this headed. A major bond crash or stock crash or both hitting everyone’s retirement fund will cause social unrest more quickly if either happens and everyone looks for a place to point the finger of blame. I predicted a bigger change toward violence in American society for 2017, and I was overly alarmist in that prediction. I think I can safely say that US society did become more divided, but it also proved more resilient than I credited it for. Having learned from that, I don’t think 2018 will be greatly unrestful, but the trend in that direction will continue. Nevertheless, the more we widen the financial gap and the more we hand impossible debts created for our benefit to the young, the worse the unrest will become in the years ahead as the young enter a hopeless financial future and seize the reins of leadership. This 2018 economic prediction is more about the slow development and continuance of the long-term prediction that I made for 2017; but watch it build, consistent with what I’ve laid out. How long it will be until we have social chaos every day, I don’t know. The real-estate market and auto market started softening last spring and summer when I said they would. Then the year became the worst year in my memory for its combination of hurricanes and fires. It was certainly a record in terms of cost at $306 billion (previous record was $215 billion, adjusted comparatively for inflation). That created the need for hundreds of thousands of new homes and hundreds of thousand of new cars. Existing home sales also skyrocket because displaced people need a house NOW! Again, that is exactly what I said last fall would happen with my housing predictions when the hurricanes and fires hit. As you would expect, the report shows great growth in the West where wildfires took out homes (and where growth has generally been solid) and in the south where hurricanes took out homes, but the report presents a picture that looks like housing collapse everywhere else. Ironically, the housing and auto industries (in terms of their overall national numbers) were saved by disaster. The disaster effect, however, should wear off early in 2018 for autos because insured cars should mostly have been replaced already, except to the extent that factories have a production backlog. That brings sales forward, making the remainder of the 2018 more difficult. The disaster effect will probably continue through most of 2018 for houses because most houses are not mass produced, and there is site cleanup, plans, permits, etc. to work through before building even begins; and there will be a shortage of labor because of so much reconstruction all at once (which is supported by the December jobs report showing the greatest jobs growth in construction, which usually does poorly in December). So, I’d anticipate a good labor market for construction workers for, at least, for most of the year, and that should help others, too. Given how long it takes to rebuild, housing could hold up for all of 2018, even improving in areas not ravaged as people move out of those areas that were destroyed because they cannot stand waiting longer to find a home or because their jobs were also wiped out. Once homes are finished, they have to be furnished … including the replacement of lost personal items like clothing. So, all of this home building will be great for retail sales for, at least, half a year, maybe longer as lost tools, clothes, lawn mowers, appliances, etc, all get replaced. However, the Fed has created a real-estate market that is utterly dependent on low mortgage rates. Quantitative easing was done to lower those mortgage rates by reducing interest on long-term debt instruments, which it believed would spill over to mortgages. Therefore, the Fed’s reversal of QE should drive those rates back up as it gets under full swing. That will create serious problems for the real-estate market later in the year. New construction loans where insurance money fell short will increase demand for loans even in a rising interest environment, helping interest rise. At the same time, the Trump Tax Plan was bad news for housing, with lower mortgage interest deduction caps and reduced ability to deduct property tax. The pressure building on housing from the Trump Tax plan and Fed interest-rate increases and quantitative squeezing will press down on the whole industry just as the hurricane-fire stimulus effect starts to wear off. So, the end of the year could start to get really rough. The reversal of QE will also start to put an interest-rate crush on consumers who have piled up even more credit-card debt than they did before the crash of 2007-2009. With bond funds, mortgages, consumer credit, housing sales and autos all getting squeezed as the year grows old and with a stock market that is already long in the tooth and morbidly obese, I cannot see how we avoid a terrible final quarter, which could be even more dramatic if there is an election upset from what promises to be a mean-spirited election year. For the time being, Republicans hold all the reins of power, so they can do a lot to try to patch the economy together, but they looked mostly like Keystone Cops last year; so I doubt they can keep it together. If Republicans do manage to hold the economy together until the election, I think things will rapidly fall apart after that, as the stimulus effect from hurricanes and wildfires wears off (barring a second round of the same this year) and the stimulus from tax cuts becomes outsized by the unwinding of QE, here and abroad. In the spirit of being fair and balanced, my next article, presents the major factors that I think could weigh against my 2018 economic predictions. After all, I don’t make any predictions knowing I am going to be right. They are just the trends that I see as having the highest likelihood of playing out. It’s always good to be fully aware of the countertrends. Survive–The Economic Collapse Economic Collapse: : The Warning signs, Impact on America, 42 Things you should buy before it’s too late; and How to develop a SURVIVAL PLANThe Money GPS: Global Economic CollapseCrash Proof 2.0: How to Profit From the Economic CollapseAfter The Collapse: A dystopian novel of our future after a worldwide economic and social collapse, and then of finding friendship and love amidst the chaos.